IGIÁ Hair Jewels The secret’s out, you can dress-up your hair and have style and attitude with "GLITTER" Jewel Tattoos Add style, flash, and pizzazz to your hair with IGIÁ Hair Jewels. 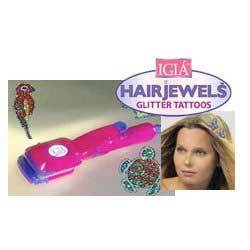 Fun glitter hair jewel ornaments attach to your hair by way of a low heat straightening unit. Better than barrettes, the glitter hair ornaments are easy and safe to use and won’t damage your hair. Includes 15 reusable glitter hair jewel ornaments that can easily be removed with water. Create unique and dazzling hip styles that will impress all your friends and put you on top of today’s styles.